Growing up, I idolized my cousin Shannon. She had long blonde hair and lived in California and was infinitely more cool than I'd ever be. My parents have video of the two of us singing on the back of my grandparents' house in Ohio (I was under 10) and I kept trying to steal the microphone from her. Seriously, I wanted to be just like her. Today, she is still just as amazing. We had to bond during family gatherings because we were the only girls of all of the grandkids and that bond stills holds today. So while I may not talk to or see her as often as I'd like, she's still just as special to me. So what does this have to do with cookies? Well, Shannon loves Pugs. Most dogs, actually, but especially Pugs. 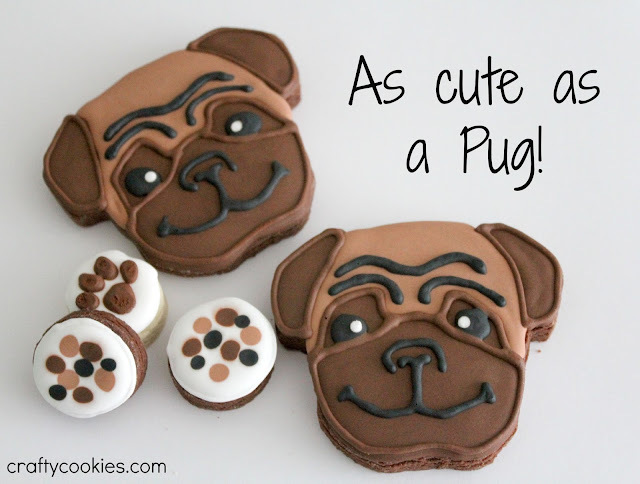 Her Facebook page and Pinterest board are loaded with cute pug pictures. 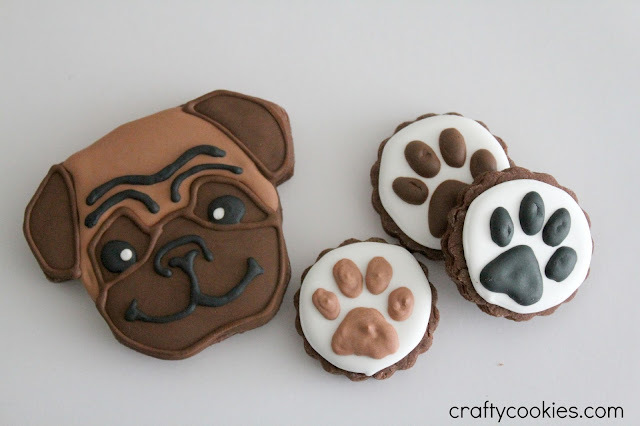 I mentioned something casually in passing about sending her pug cookies for her birthday, but that was back in April, and no cookies were sent. Bad cousin. Now that it's summer, I figured it would be a great time to send a way-belated birthday surprise. 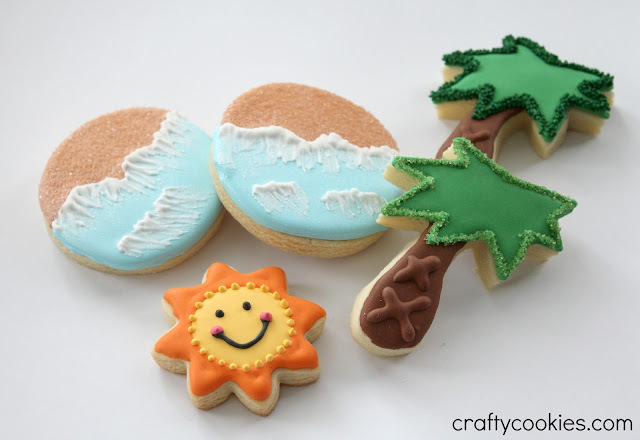 These cookies were actually pretty easy to decorate. The cookie cutter I used was from Cheap Cookie Cutters. I also decided to make chocolate sugar cookies to go with the colors. 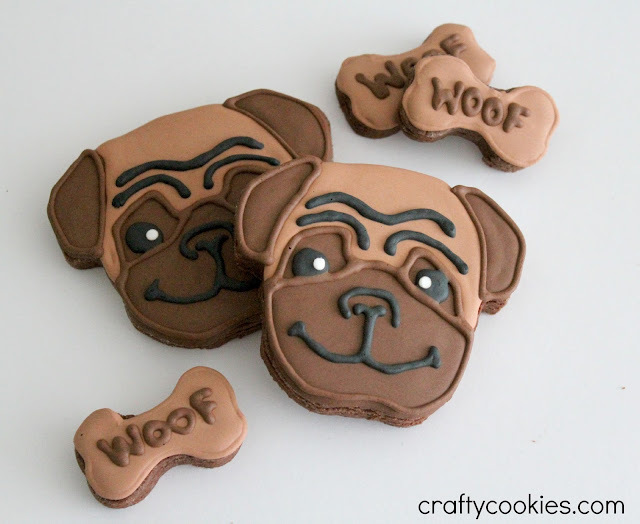 After researching tons of Pug faces (those Facebook and Pinterest photos were helpful! ), I determined that I really only needed three colors: dark brown, light brown, and black. 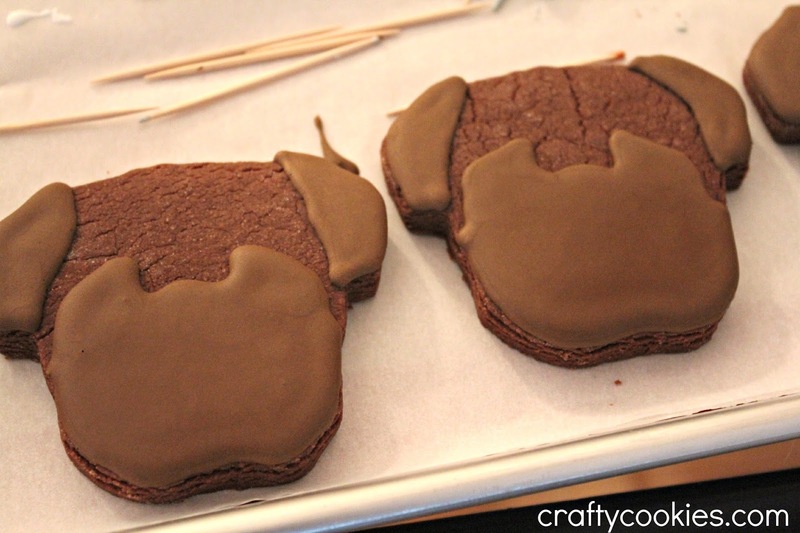 I outlined and flooded the areas for the dark icing and let them dry for about an hour. 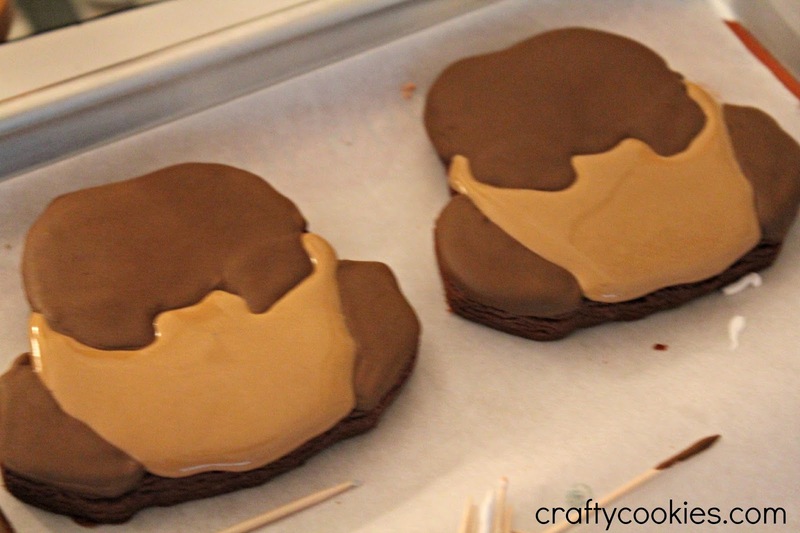 Then I added the light brown using 20-second icing (icing that is a mix between piping and flood consistency). Sorry for the upside down photo! After these dried for several hours, the last step was adding the details to the face using black piping icing. I made a smaller few paw prints and dog bones (for us to eat, not dogs!) to go with the cookies. After looking at all these Pug cookies, I can easily see why Shannon loves them. They are too stinking cute! I sent Shannon two boxes of cookies, which she should arrive today (in one piece, hopefully!). I hope she enjoys the late Birthday treat! 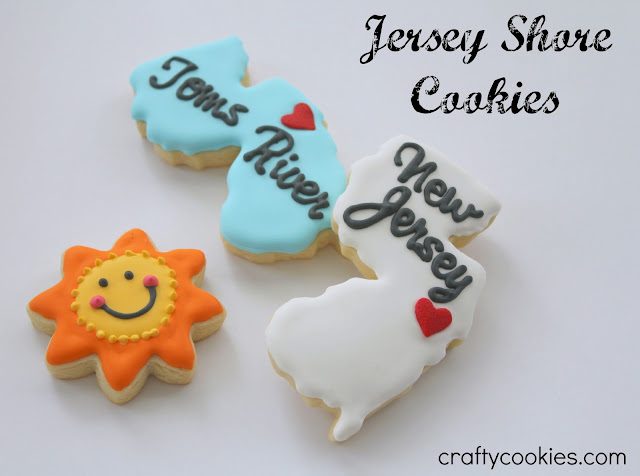 When we were invited to our friend's barbecue this weekend down at the Jersey shore, I knew I wanted to create some themed cookies to go with the event. 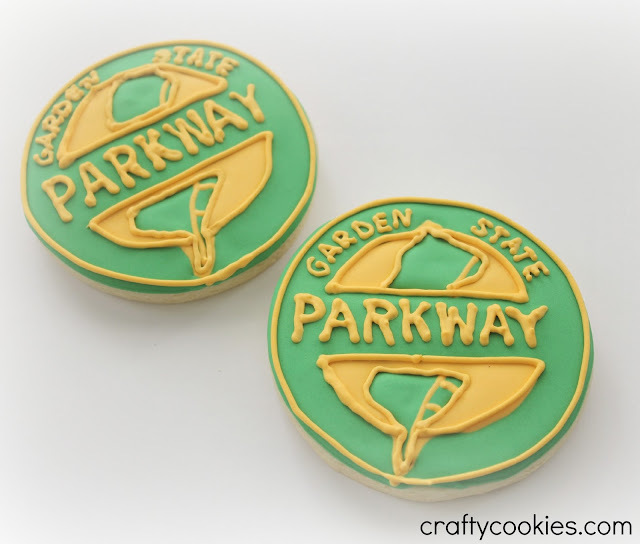 Cookies in the shape of the Garden State was a given, but I was trying to think of something else, that didn't evoke that once popular MTV show. The Garden State Parkway is the main road to the shore points. Growing up, we never went to the Jersey shore (it's a hike from Ohio), but I've heard stories from my mom and grandmother of them visiting my great-grandmother who once owned a little house on the beach in Lavallette. I wish my family still owned that house today! The weather was perfect for the barbecue and we got to spend some time with our friends. They have a great house in Toms River and definitely know how to throw a party. 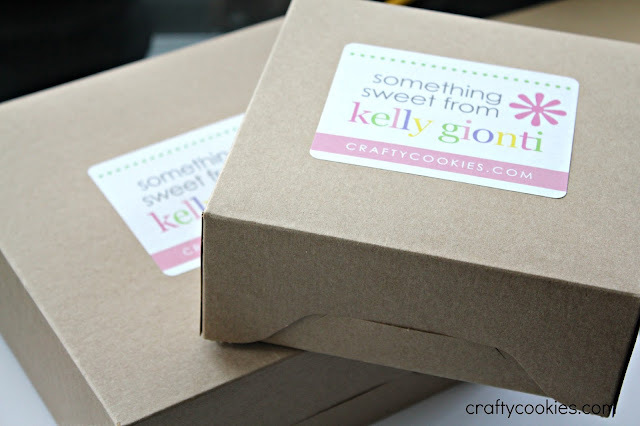 I packaged the cookies in my new boxes from BRP Box Shop and they were good to go. I love the sizes of the boxes and how easy they were to put together. Hope you all are enjoying your summer! 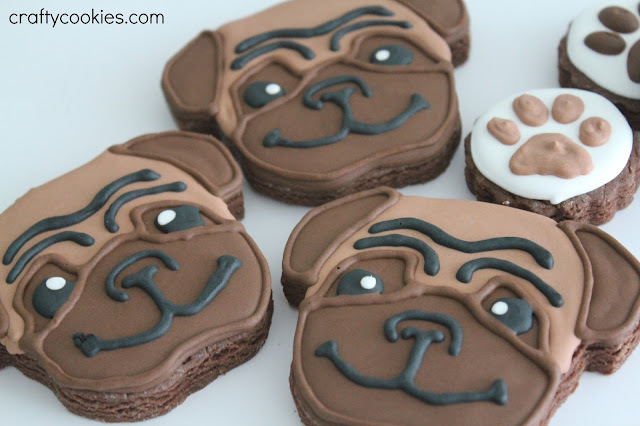 I made these cookies on a whim a few months ago after seeing some cool designs on etsy and just remembered that I never posted a picture. I was experimenting with disco dust and a new royal icing recipe, so I wasn't in love with the lettering once they were dry. 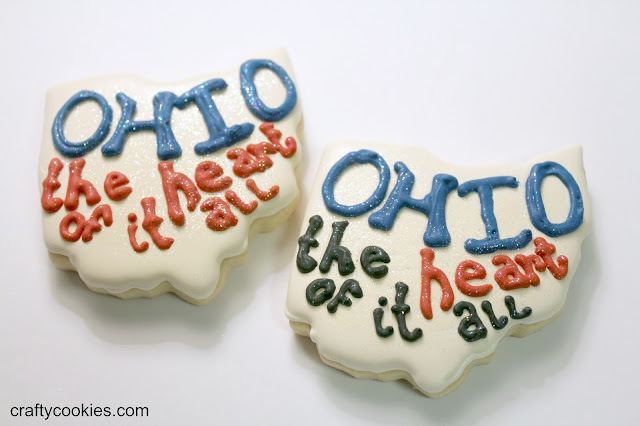 But the Ohio cookie cutter shape looks so cool, it would be sad not to share. Perhaps I'll have to try again next time I go visit my home state, which hopefully is soon! It's not technically football season yet, but they were perfect to take to my brother when we visited him in Miami a few weeks ago. My brother has been a Cleveland Browns fan since birth, under the heavy influence of my dad. 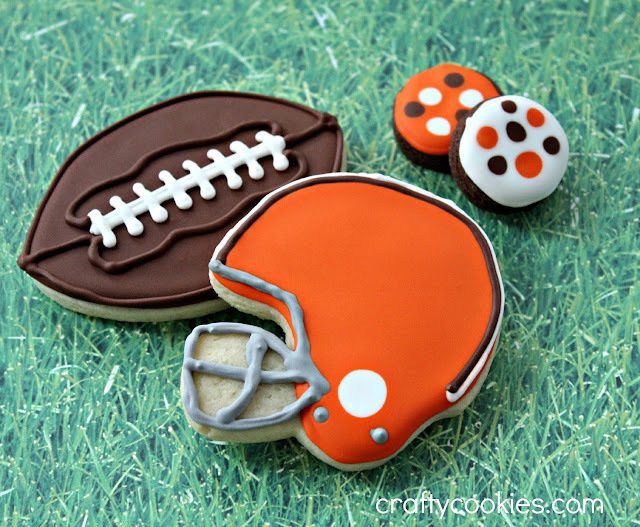 I made several football logo cookies, along with some chocolate minis in Browns colors. Maybe I should have made all the cookies chocolate since they go with the color scheme. I have to say, the Browns have one of the easiest logos to recreate! I had to do some research to figure out what an official NFL football looks like. I wanted to add some white stripes to the sides of the football, but my husband informed me that was only for college football. You'd think being from Ohio that I'd know the difference. I'm sure I'll be baking another batch of these cookies once football season begins to send to my dad, uncle, nephew, and all the other Cleveland fans in my family. 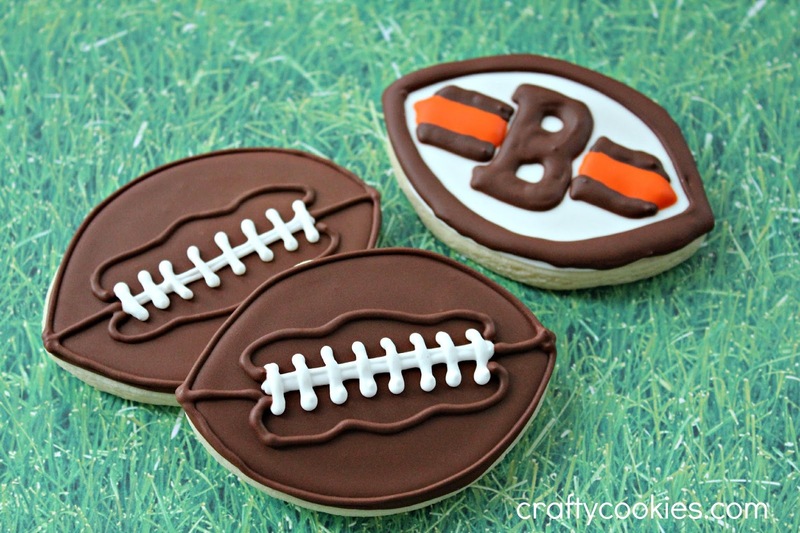 Next time I'll try to recreate the old Cleveland Brownie. 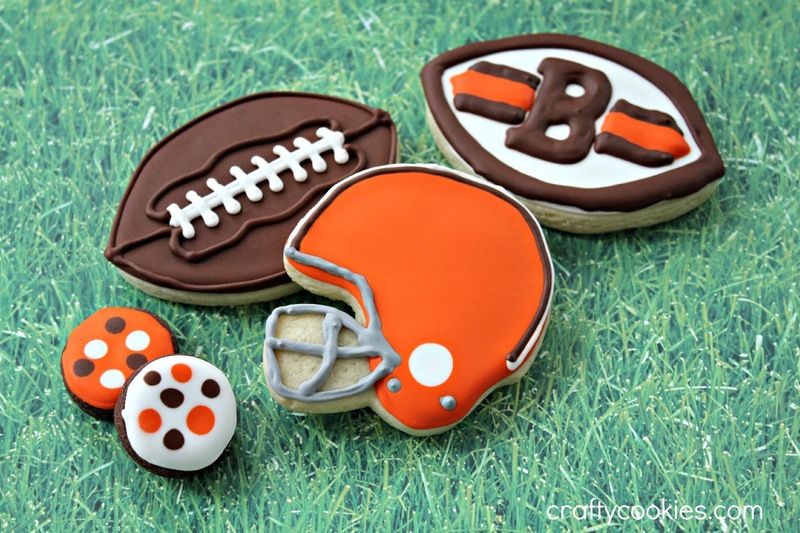 Go Browns! P.S. 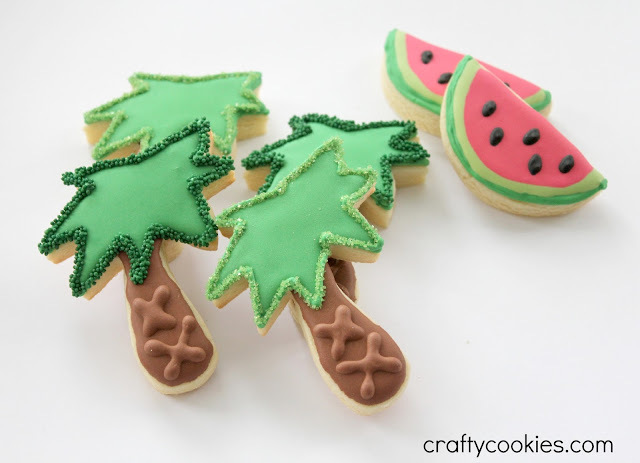 - Don't worry, these cookies aren't sitting on grass! I used an extra piece of scrapbook paper I had on hand to give field effect. Hope you all had a wonderful July 4th! 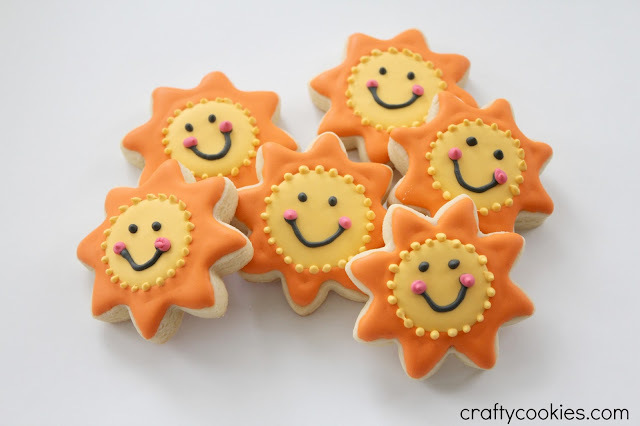 Here are a few more cookies I made to share with my family. 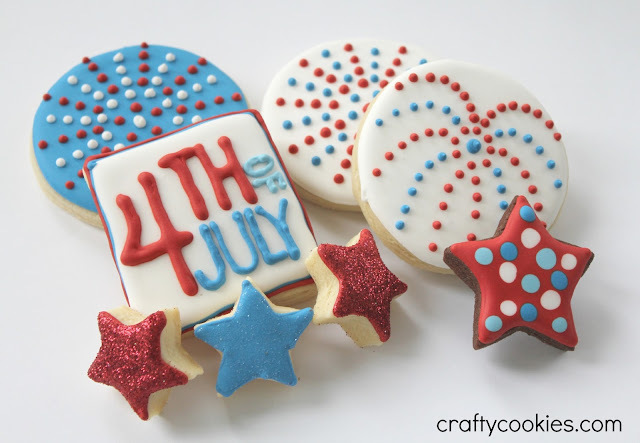 I love the simplicity of these firecracker cookies. Easy enough, yet they have a sophistication about them. These NYC-themed July 4 cookies were probably my favorite. In all the years I've lived in the City, I've only seen the fireworks there once, back in 2001. As soon as school ends, I'm usually off travelling with my husband, so we miss the fireworks. One of these years we'll have to stay in town! As a teacher, the 4th of July is easily one of my most favorite holidays, as it marks the true beginning of summer. 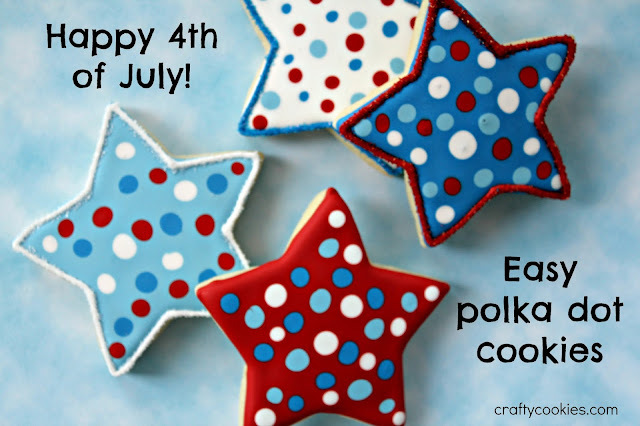 Unfortunately, July also brings hot, humid weather which doesn't fare too well for baking and decorating cookies. However, these cookies are a cinch to decorate, hot weather and all. 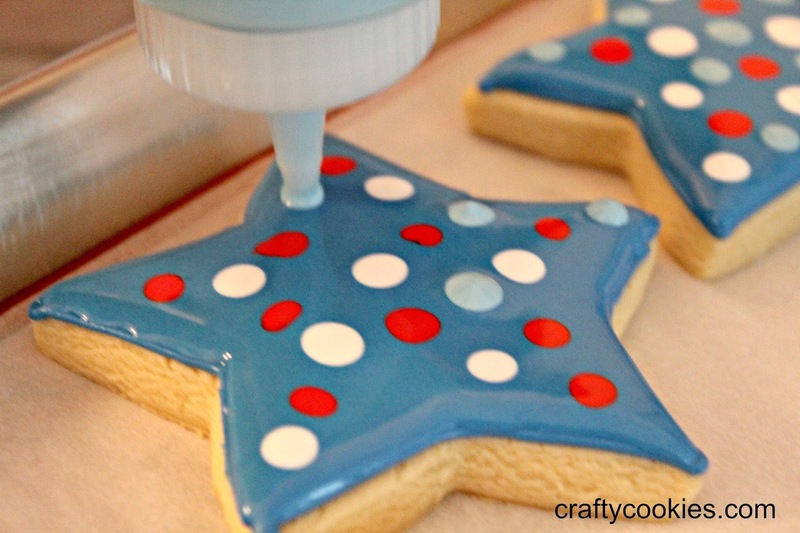 One of my favorite decorating techniques is creating polka dot cookies using the wet-on-wet technique. Confused? Let me walk you through the process. 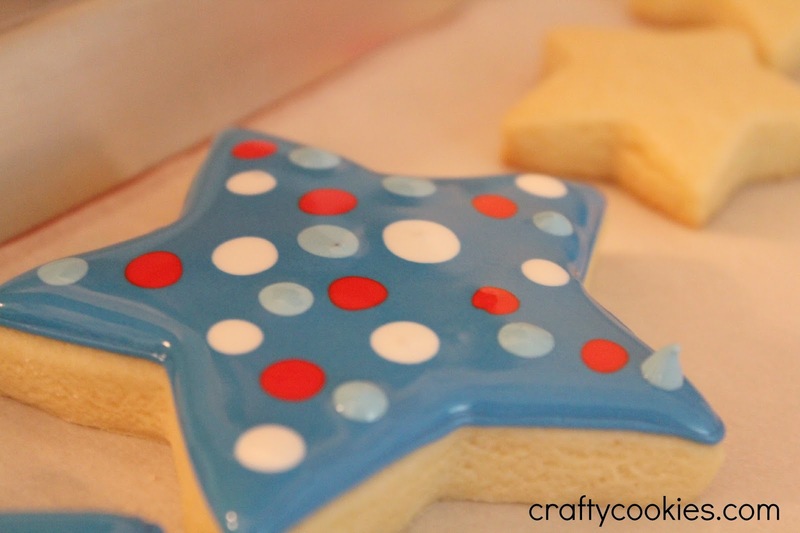 To start, you need your cookies, baked and cooled. You also need your royal icing colors, in both piping consistency (think peaks) and flood (think glue). 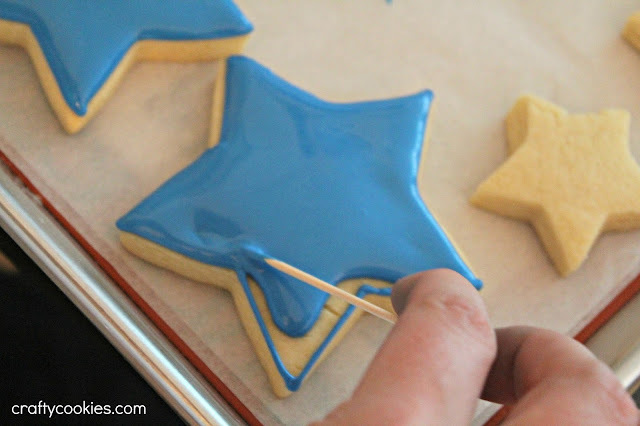 Outline your cookie with the piping icing and flood using a squeeze bottle and a toothpick to get the icing into all the corners. Be careful not to over fill your cookie with the flood icing, or you may find icing dripping over the edges. 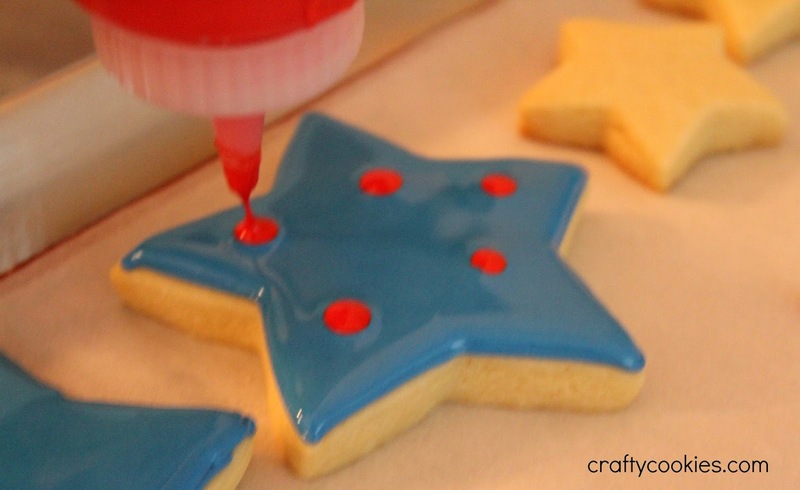 The next step is to take a second color of flood icing and squeeze little drops onto the flooded cookie. The dots will vary in size depending on how long of a squeeze you gave. You could easily stop here and let the cookies the dry. 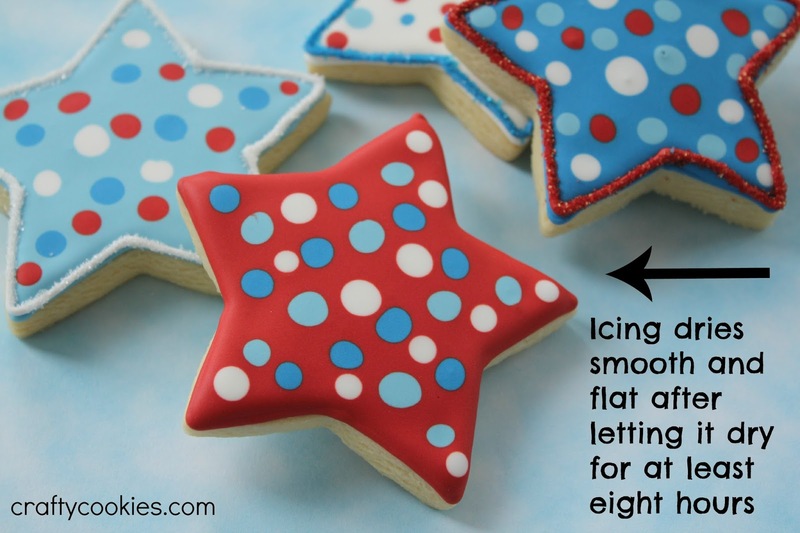 Or, you can repeat the above step with more icing colors. Repeat again with another color if desired. 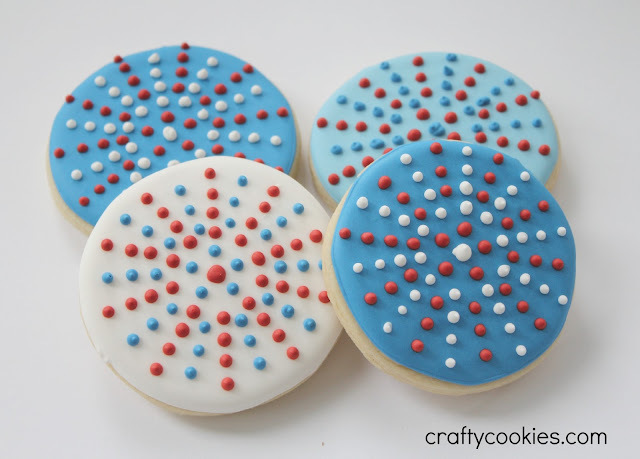 I chose four colors for these cookies and alternated the colors depending on which color I used for the base. See that light blue blob in the right corner of the star? Don't worry, it will smooth out as it settles. Let the cookies air dry overnight or at least eight hours before packaging or moving. When finished, your cookie will be nice and smooth with cute little polka dots. 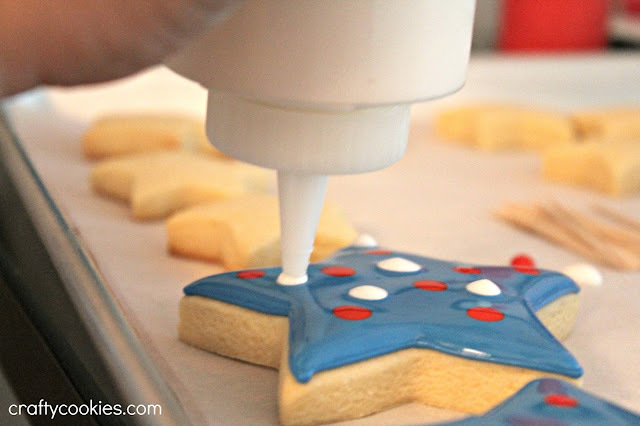 If you decide to add a border or some sanding sugar to the edges (like I did on a few of the cookies above) make sure the entire cookie is completely dry so the sugar doesn't get all over the place. 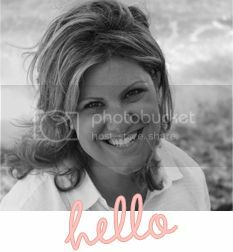 The great thing about this design is that it can be used for any holiday or event, just change up the colors. 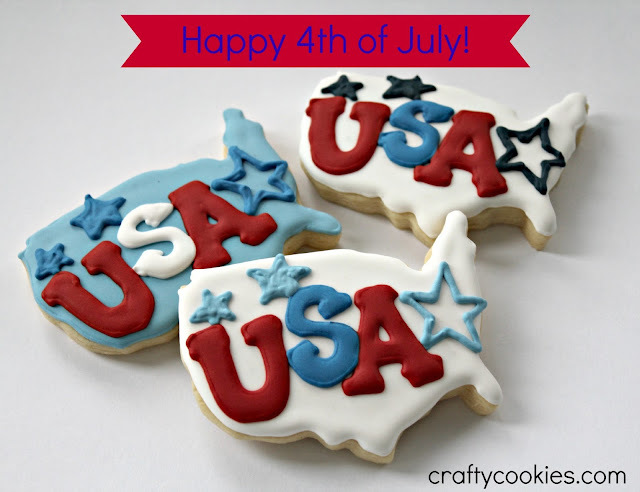 I hope you all had a happy and festive 4th of July! 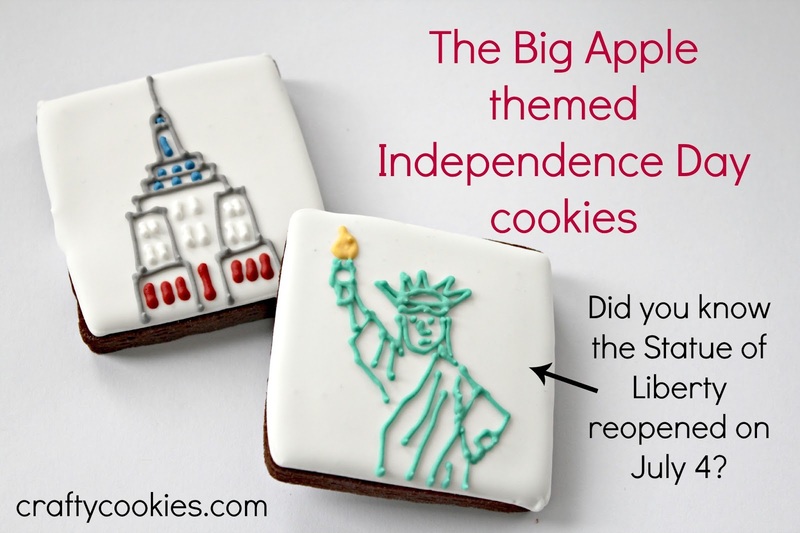 I am celebrating America's independence and my brief independence from lesson planning!